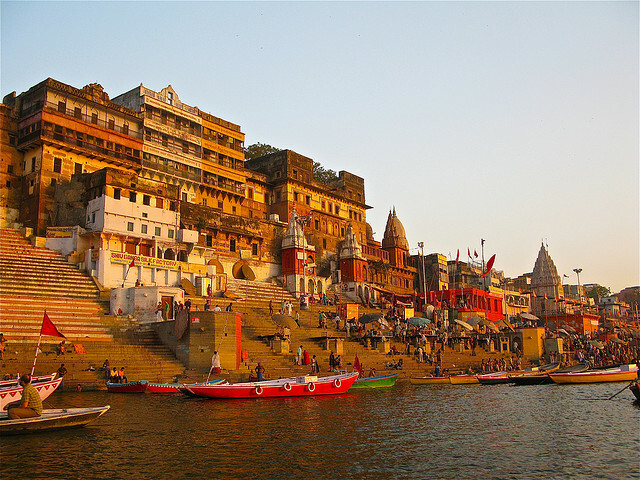 Varanasi is located on the banks of the Ganges and is also the holiest of the seven sacred cities. It is the oldest city in India and one of the oldest continuously inhabited cities in the world. It is known as the religious capital of India and, as such, it attracts many local and international tourists. As a result, you can expect to enjoy all the benefits of a busy city including transportation systems, various attractions and different types of accommodation in Varanasi. A visit to Dasaswamedh Ghat is usually on the top of every tourist’s list when visiting Varanasi. Here you can enjoy a boat ride and make your way to get to the perfect spot for the famous religious practice of Ganga aarti. Asi Ghat is the southernmost ghat in Varanasi and is where those travelling long distances come to bathe before honouring their lord, Shiva. The Bharat Kala Bhavan museum has a fantastic collection of bronze and clay sculptures as well as paintings and embroidered textiles on display. Another interesting site to visit is the Dhammek Stupa monument as well as the Ramnagar Fort. These structures are both interesting as far as their architecture is concerned and certainly worth visiting for anyone who is looking for a full and well-balanced tourist experience when visiting Varanasi. A visit to the Ganges River itself is another popular activity for locals and visitors although many are reluctant to take a dip. There are a large number of boats that travel along this river and many locals use the river to bathe as well. The Sarnath Archaeological Excavation Area is another location that will allow you a glimpse into the local history and culture. It is certainly worth adding to any traveller’s itinerary. Being a city of such massive religious importance, it should come as no surprise that there are a large number of religious sites to see. The Sarnath is an important structure in Buddhism and, along with other structures in the area, it is a famous local religious attraction. Other places of religious significance in Varanasi include the Kashi Vishwanath Temple, the New Vishwanath Temple and the Tibetan Temple, to name just a very few. For a full and satisfying experience, it is a good idea to research each and every location in advance so that you can fully appreciate its history and importance when you do visit. When planning your trip and wondering where to stay in Varanasi, the best thing to do is to run a search online. Take a look at all the different hotels in Varanasi, compare their prices, location and which amenities come with each one.